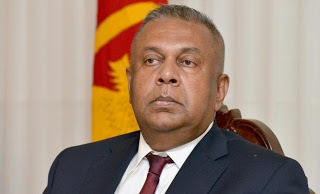 Joint opposition frontline and former minister, Bandula Gunawardena, said the JO would bring a no faith motion (NFM) against Finance Minister Mangala Samaraweera claiming that he had misled parliament by presenting inaccurate information, statistics and other data in the Budget 2019. “I will start the drafting of the NFM at the auspicious time of ‘Weda Alleema’ (beginning work) during the New Year festivities. Addressing the media at the weekly SLFP news briefing at the ‘Center for Transformation’ in Colombo. Mr. Gunawardana went onto say that the sectoral committee in parliament on financial management chaired by TNA parliamentarian M.Sumanthirana, has categorically said that the statistics and other information contained in the Budget 2019 were incorrect and therefore implementing the budget proposals was only a false promise. “We have asked the Central Bank to submit a report on false data found in the Budget 2019. After we gathered all incorrect information and statistics, we would ask party leaders to move an NFM against Mangala,” he noted. “The financial control of the state is the responsibility of parliament. Misleading of parliament on financial and monetary matters is a serious issue as it will disrupt the financial control and endanger the development programmes. What we can gather from wrong budgetary date is that the entire so-called development programmes of the government are only a wishful thinking. As such we have no confidence in Mangala and only option remains with us is an NFM against him,” Mr. Gunawardana stressed. Mr. Gunawardana charged that people are trying to make ends meet due to high cost of living and having New Year celebrations is only a dream. Responding to the Daily Mirror on the slight appreciation of the rupee in the last few weeks, Mr Gunawardana said the government has issued sovereign bonds to the tune of U$ 2.8 billion for a huge interest rate to strengthen foreign reserves. “As a short-term solution to the depreciation of the rupee, this is good. But in the long run, the government will have to pay a bigger interest rate to foreign banks and it will reflect very badly on the economy and money market, he emphasised.